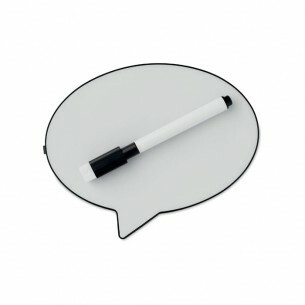 Make leaving messages more fun with this original printed message lamp, a unique promotional item that you will find plenty of uses for. The lamp sits on a desk or table, and the user can write a message in ink on the white surface. The light then shines through to reveal the message, and it can be removed using the eraser. It runs on 3 x AAA batteries, which are not included, and it would make a fun branded gift idea for customers and corporate clients. Our message lamps are made from mixed and is available in black. Print this product on the front (other positions may also be possible). This desk item product is printed in up to 8 colours via digital pad print, which is a technique suitable for almost all backgrounds and shapes.